The Compact series includes devices with a power level ranging from 1.1kVA to 4kVA that allow for optimal use of available energy, either as an off-grid inverter, battery charger or solar charge controller. This range of robust products ready to be used offers an excellent price/efficiency relationship. Every product of Compact series combine 3 functions: performing standalone inverter, powerful battery charger and ultra-fast transfer system. All in a robust casing. Equipped with a programmable auxiliary contact, it allows the start of a generator or second priority load shedding. Also these inverter-chargers can be supplied in option with a built-in PWM solar charge controller, making them an “all-in-one” solar hybrid system, or a simple self-consumption/backup system. In addition to their compact construction, these devices are shipped with battery cables already assembled, reducing the system installation and commissioning costs.The primary parameter adjustments can be done directly on the screen on the device, that also allows to see the different modes of the inverter. The Compact is a high value Swiss product that brings together the essential functions of a robust and compact construction, meeting all requirements, and with an excellent price-features relationship. 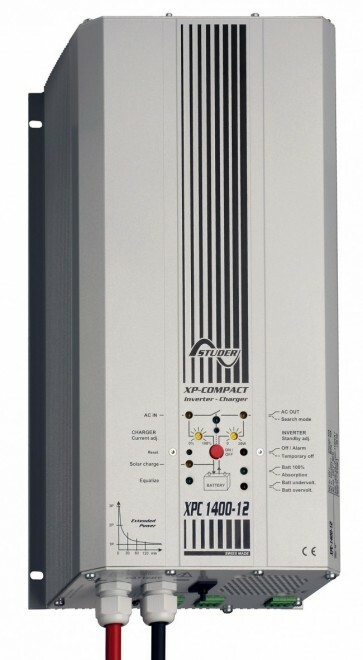 The XPC 1400-12, XPC 2200-24, C 1600-12 and C 2600-24 are certified in accordance with the ECE-R 10 standard. This certification is mandatory in the European Union for all electrical equipment on board transport vehicles.